Destined to become a classic, this book is the natural result of not only years of playing jazz guitar but also of the author’s long associations with many innovative jazz guitarists. This comprehensive guide is one of the first jazz methods to focus entirely on the blues idiom and its contribution to jazz improvisation. It is designed to help you play authoritatively in a broad spectrum of jazz guitar settings from big band to small combos to a solo context. 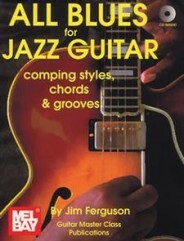 This book is divided into 4 sections which addresses 12-bar blues progressions, 3-note Freddie Green-type chords, shuffles, swing riff comping, chord scales, linear bebop comping, modal concepts, triads over bass notes and a wealth of chord voicings and inversions. Includes over 110 music examples, 45 complete 12-bar choruses, and a CD with 30 tracks. It also offers a helpful glossary of jazz terminology. Written in standard notation and tablature. Series : Guitar Master Class Pub.